> See how it works. > Why try an EESeal®? Generic or Custom EESeal® sample! EESeal® FilterSeal EMI Filter Inserts install in YOUR connector by hand in seconds, no soldering. Get a FREE sample, designed & built to your needs, in about 24 hours! Over a million sold, over 14,000 EMI problems fixed. For most connectors. Many options, filters, TVS & other components. If you have an EMI (DO-160, MIL-461, etc.) or ESD problem right NOW, we can help! Please request a FREE custom sample, designed and built specifically to your needs. We routinely ship free custom samples in 24 hours. 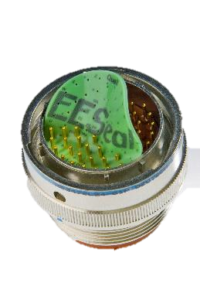 Or, if you don’t have an EMI or ESD problem today, but you want to see an EESeal® for yourself, please request a generic sample.